The Charleston Hardware Company began in 1999 with antique hardware sales and restoration services. Our customers often requested large numbers of matching pieces so we began collecting original antique patterns, and in 2003 we began reproducing. We have four foundries, a lock maker, a glass maker, a ceramics maker, and a plater. Charleston Hardware Company takes much pride in manufacturing the most authentic reproductions possible. Antique American pieces are collected and moulds and dies are painstakenly re-created from original American antique pieces. Each piece is made using the same techniques originally used over 125 years ago. At Charleston Hardware Company, our focus is on historic preservation. 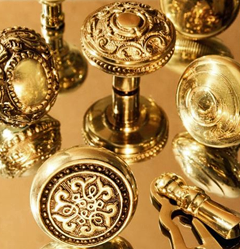 Our mission is to preserve the historical integrity of authentic antique hardware through the restoration and reproduction of antique original pieces. Our reproduction hardware is copied directly from antique hardware originals and crafted by hand using the same procedures of over a century ago. Each piece is hand cast in iron, brass, or bronze to match the detailing, textures, and colors of the antique originals. We are committed to making the most authentic reproduction hardware possible. We also offer antique hardware restoration, including paint stripping, cleaning, polishing, re-plating and repairing and re-keying locks. We stock spindles, set screws, and all the parts and pieces needed to restore an old house as well. Charleston Hardware Company assists building professionals and homeowners directly in the design, selection and installation of hardware appropriate for a particular project.